To my surprise, they came out beautifully: dark browns and reds, swirled and mottled where the skins had pressed or decorated with tiny imprints of leaves and flowers picked from our yard. I absolutely adored these elegant little eggs and quite honestly, breaking some of them almost broke my heart. Pretty grasses, flowers, leaves, tape, string, etc. You can get all sorts of colors by using different types of food items. The South Texas Unit of the Herb Society of America has a great page on dyeing naturally with suggestions on interesting items to use for colors, from red cabbage (which produces blue dye) to the more exotic brazilwood for pink or cochineal for fuschia. They also have recommendations for a cold dye process that makes it easier to do multiple color overlays. Get out your old pot and fill it up halfway with cold water. Dump in enough onion skins to come up to the top or above and begin heating the water to a simmer. Press down on the onion skins so that they all get soaked – you should wind up with a pot full of water and onion skins. Keep adding skins and water as needed. Once the water comes to a simmer, add prepared eggs and keep the water simmering for about 12 to 14 minutes. Remove the eggs to a bowl filled with ice water. Once cool, clean off the eggs and refrigerate or enjoy. 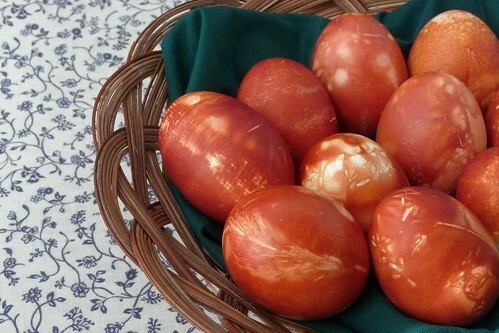 But… how to prepare the eggs? Depending on the look you want, try different things. 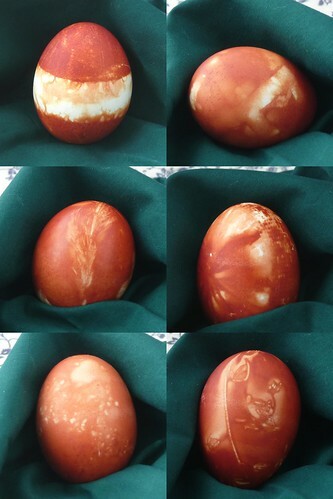 I love marbled eggs and making patterns with different items. Most importantly… Be creative and have fun! For solid eggs, just add the eggs to the pot and simmer for 12 – 14 minutes. 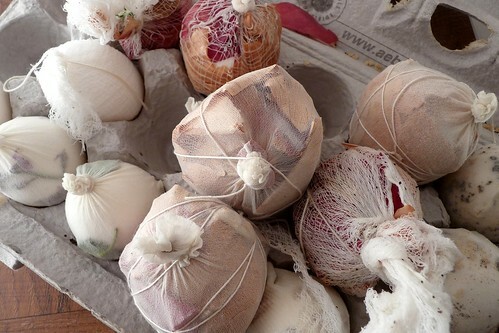 For solid eggs with texture, wrap tightly in hose or cheesecloth to get a woven texture. Pack dry onion skins into a knee-high stocking or piece of pantyhose. Nestle the egg into the skins and pack tightly with skins before tying off the hose. Tie tightly around with string to press the onion skins into the egg. The more you pack, the lighter the egg. For pretty patterns and dark color, only use a few skins. Marbling comes from many small pieces touching the eggs in different ways, so nestle accordingly. 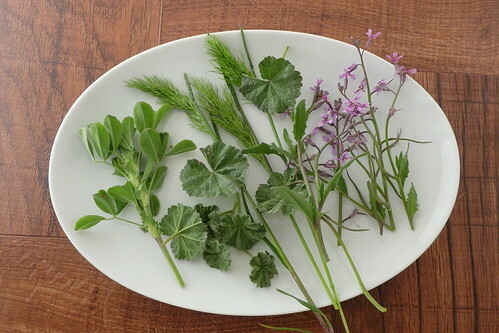 Dampen herbs, leaves, flowers, grasses or other solid flexible objects (stickers too or even wind string or rubber bands around the egg) so that they will stick to the egg. Carefully nestle the egg into a piece of pantyhose and tie very tightly shut. Use bits of masking tape to draw lines on the egg. Anything covered by the tape won’t dye, so this can be a great way to do several colors for a fantastic result. But, as you can see from our “flag” egg, you must make sure the tape is completely flat – any gaps and dye will seep in. Sprinkle damp eggs with used coffee grounds, raw bulgur or buckwheat groats, then nestle into a pantyhose and tie tightly. The more you use, the less dye you will have. 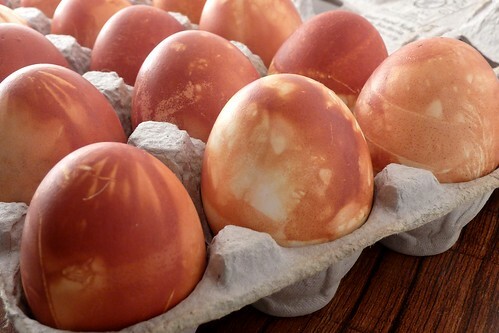 A bit of vegetable oil rubbed on the dry, finished eggs will add a nice sheen to them, making them all ready for Easter morning. 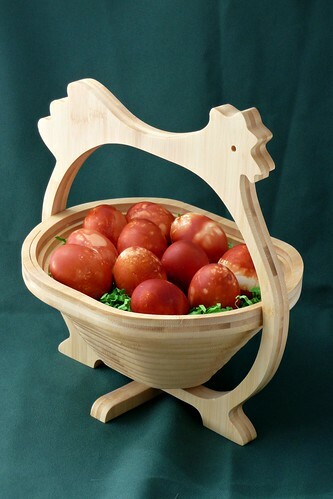 This entry was posted in american, holidays, latvian, recipes, snack, untranslated. Bookmark the permalink.